The payload for the MADHEN Eggsplorer-1 High Altitude Balloon that I and the SKARS team launched in June has been located washed up on a beach in the Netherlands. 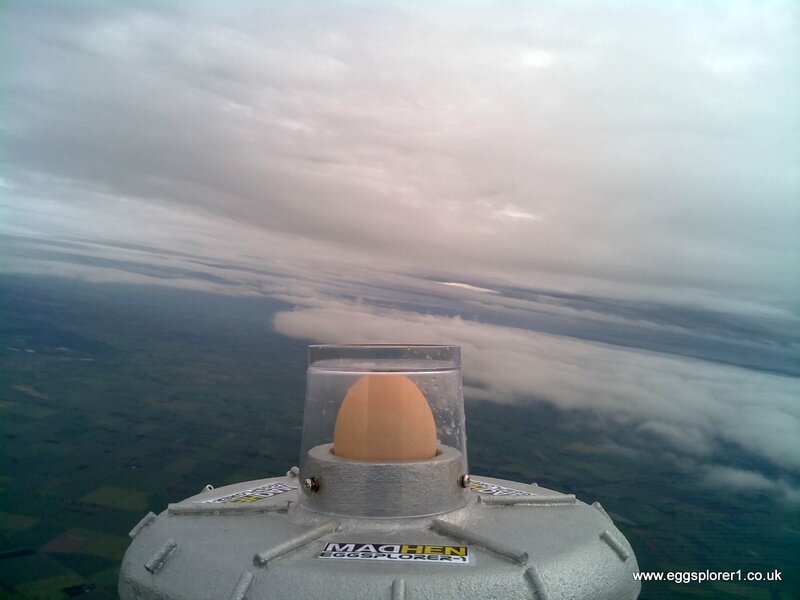 Amazingly the egg was still intact inside the capsule. 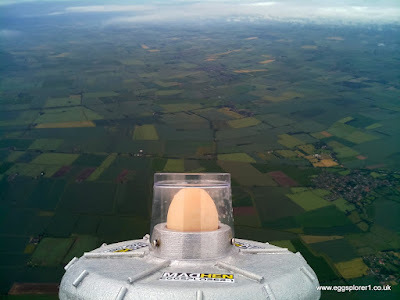 On Friday evening I went to the Hucknall Rolls Royce ARC to give a presentation of HAB flights including details of the Eggsplorer-1 launch and its subsequent apparent loss at sea, then yesterday we had a trip to North Yorkshire and visited the Boon Hill Show and I admired the display of eggs within the produce tent. It must have been synchronicity since a few hours later despite the poor mobile phone coverage I spotted a message on my mobile phone. 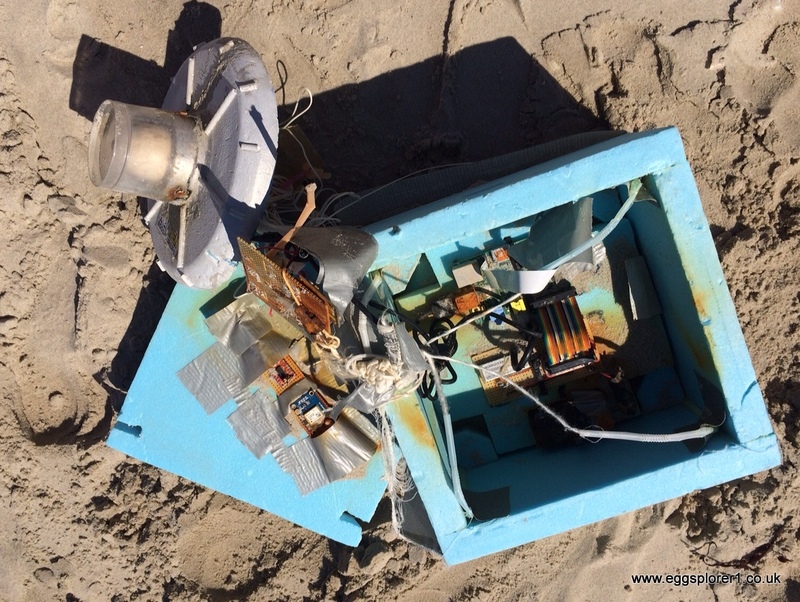 It was from Jan Wouter Kramer from the Netherlands, whilst out on a remote beach in Terschelling he had found the Eggsplorer-1 washed up and taken some photographs! 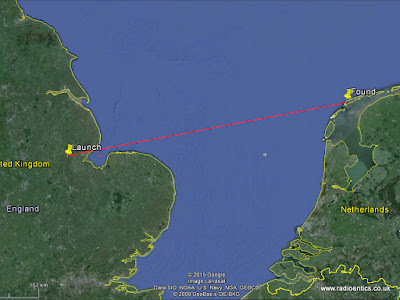 Nearly six weeks to the day after launch she had been found with the egg apparently intact! I tried several times to ring back but the poor mobile coverage prevented it so sent a text message hoping it would reach him. I couldn’t wait to get home to and finally did just before midnight. Found your email on the site. These are the pics we made. We found it today about 14:00 during a walk on the beach of Terschelling in an area were not many people are walking because it’s more than a two hours walk from the nearest houses. As you can see the egg wasn’t damaged but had probably lost it’s strength. While trying to investigate what was inside the ‘bulb’ it broke open and the egg broke in two parts. It was nearly empty. Only a few cc of dark ‘water’ was left in it with a terrible smell ……. Sorry I was able to take your call this afternoon but was out of coverage for most of the day. Thank you very much for the information and pictures of the Eggsplorer-1. 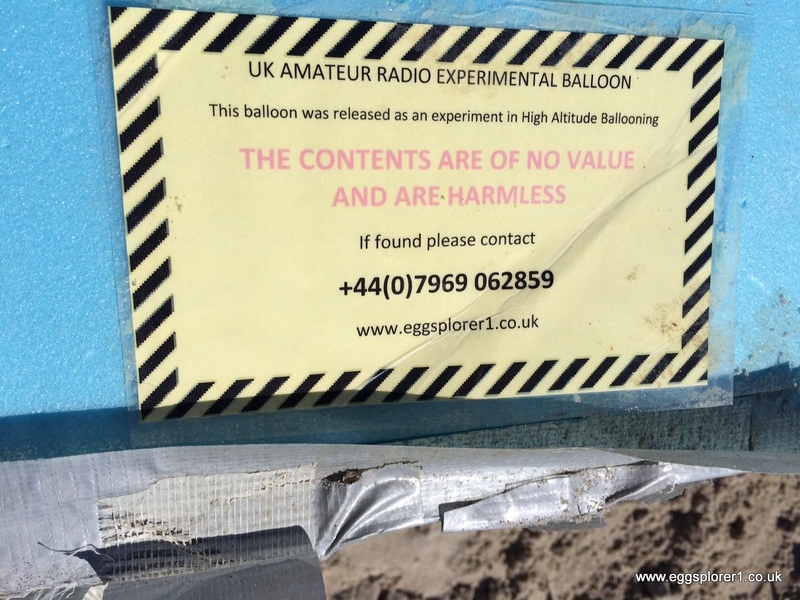 It was our first ever balloon flight and after it landed in the sea I thought we would never see it again. Amazingly it appears very much intact, shame about the egg being rancid, would really have liked to get it back and would have paid for shipping – but I can imagine the smell was awful. The Raspberry PI circuit board inside the box had a SD memory card which was held down with gaffa tape, I am not sure if it is still attached and it may have contained some photos of the flight taken with the onboard camera. However given the remoteness of the payload I understand if it is too far to return for such a slim chance. Hi Andrew, thanks for your email. 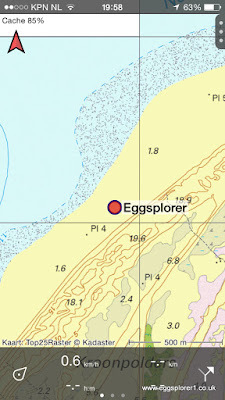 The good news is that I found the local police willing to pick up the remains of the eggsplorer. 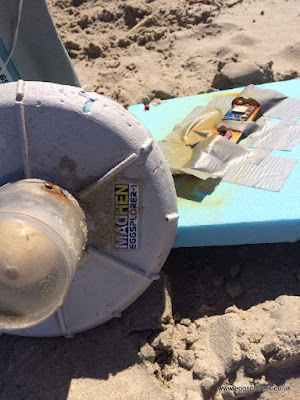 (They are allowed to drive on the beach by 4×4) I just got a phonecall that they found it and are willing to send it back to you. So you have an address for me ?? As you can imagine I am totally EGGSTATIC!! I rang Jan this morning and had a great conversation, seems he visits here every year and goes beach-combing with his son, they have never found anything quite as exciting as this! So MADHEN Eggsplorer-1 has traveled 31km into the stratosphere, landed in the sea and traveled approximately 370km from launch site to its final resting place on the beach. The World Egg Throwing Championship people are very eggcited. Just hoping that there are some photos on the card if it has survived, cannot be sure from Jan’s photographs. 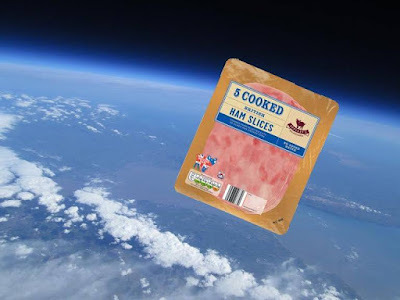 Since the flight I have suspected two possible fault scenarios, bad connector on the SD card on the Raspberry Pi or the antenna was broken off due to the backup tracker suspended underneath. I am hoping it was the latter and the card is recoverable and readable since it would contain pictures. The backup tracker is also there but has lost its polystyrene egg cover, gps-antenna and battery pack but can see it is still attached to the main payload. The question is how long it has been on the beach? Given the relatively good condition of the box and the labels are still attached it may have been quite soon after splash down. I am indebted to Jan for taking the trouble of contacting me and the police, I can’t thank him enough! When I get the payload back I will post an update. 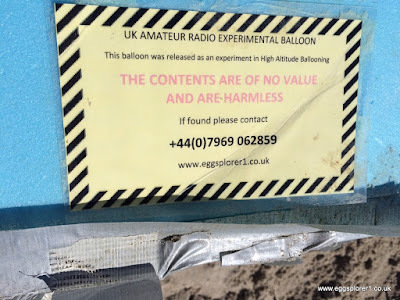 All the members of SKARS are eggcited and gives new impetus for the National Hamfest flight next month. Following our sojourn to Scotland we spent this weekend visiting and catching up with the relatives, as a result radio activity was a little limited. 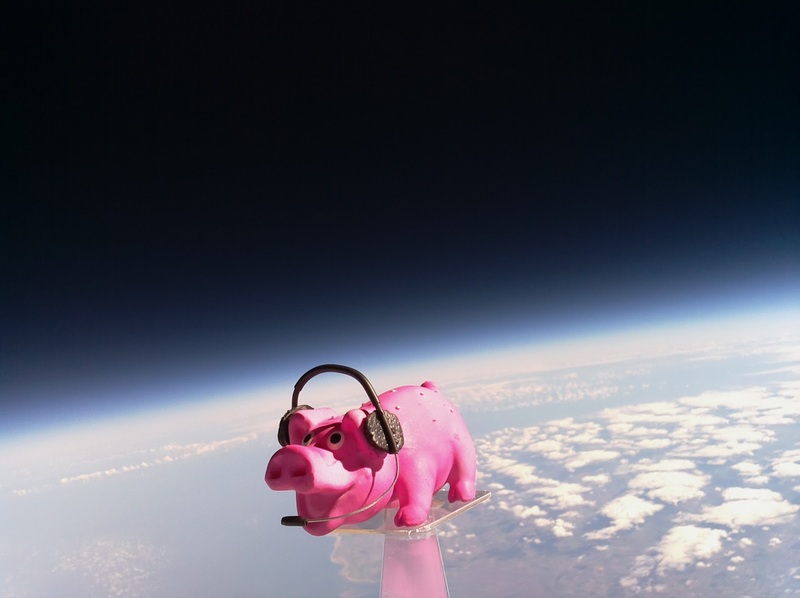 Yesterday we were visiting my mother-in-law and I had seen that the University of Southampton Spaceflight Society were launching a High Altitude Balloon from the New Forest. I am never one to miss the chance to track them and decided at the last minute to throw the Alinco DJ-X10 receiver and an audio lead into the bag with the laptop which by happy coincidence we were taking since it contained the holiday photographs. After an enjoyable Sunday lunch I dutifully did the washing up and then as the others succumbed to postprandial somnolence I sneaked off to see if I could receive anything as the flight was already well under way. I put the Alinco on an upstairs windowsill with the W-881 Watson Super Gainer antenna fitted. 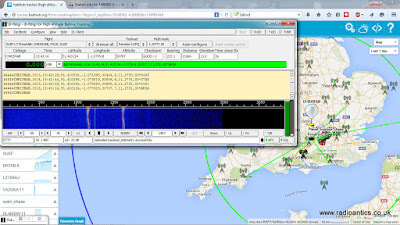 The radio which has SSB capability was still tuned to 434.650MHz as this was the frequency I used on the EGG1 tracker and amazingly I heard clear RTTY telemetry of the CHRISHAB tracker and connecting it to the laptop with a simple earphone-to-microphone input lead was getting clear decodes. Being a silver surfer my mother-in-law has a broadband connection so was able to upload the packets to the tracker system. I left it running while I returned to be sociable. 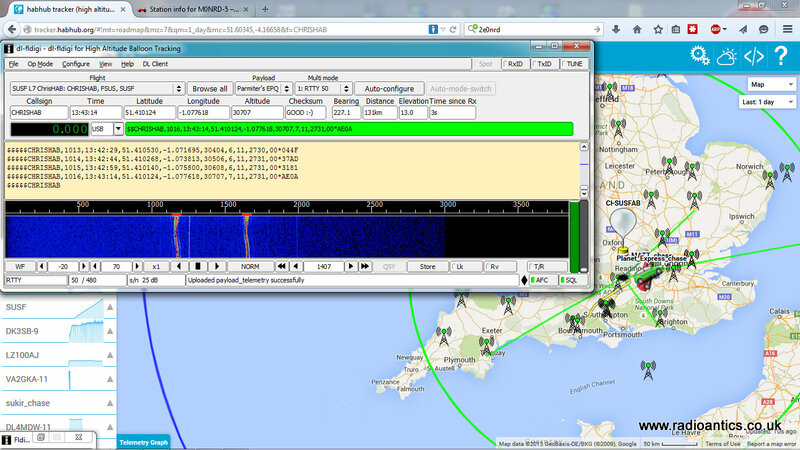 When I checked back later the flight had ended but I was more than happy with the number of decodes I had achieved with this modest set up and proves with all things radio it pays sometimes just to give it a try! The previous day I visited my mother and got to try my brother’s very nice new Yaesu VX-8R hand held. 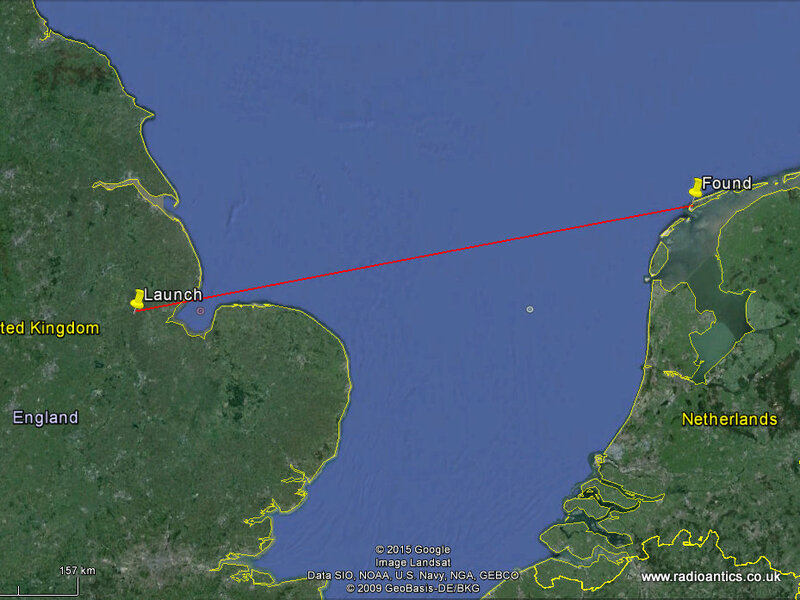 I made a short QSO with MX0PPC the Central Amateur Radio Circle (CARC) who were running some intermediate classes that afternoon. My brother is getting to grips with it and its in built APRS and GPS and soon hopes to be spotted by the International Space Station digipeater. I have just returned from a much needed break away to the Inner Hebrides of Scotland, consisting of a week on the Isle of Skye and then a week on Islay. It was our fourth visit to Skye but Islay was a new destination for us. While it was primarily a holiday away with the wife and dogs doing some walking, sight-seeing, visiting the numerous malt whisky distilleries (especially on Islay and Jura) I also planned to do some operating. Last year I did operate from the same rented cottage on Skye but this year I wanted to do some portable working on both islands. With this in mind and following my disappointment last month I had taken time to properly prepare. 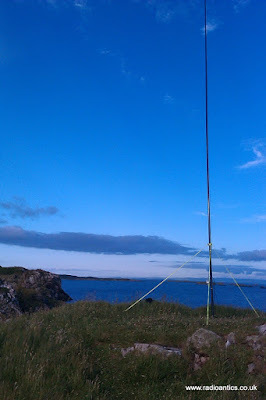 As well as repairing the end-fed wire “magitenna” that had caused issues last time out I had constructed a linked dipole for 40m/20m for a simple inverted-vee using a fibreglass windsock pole. 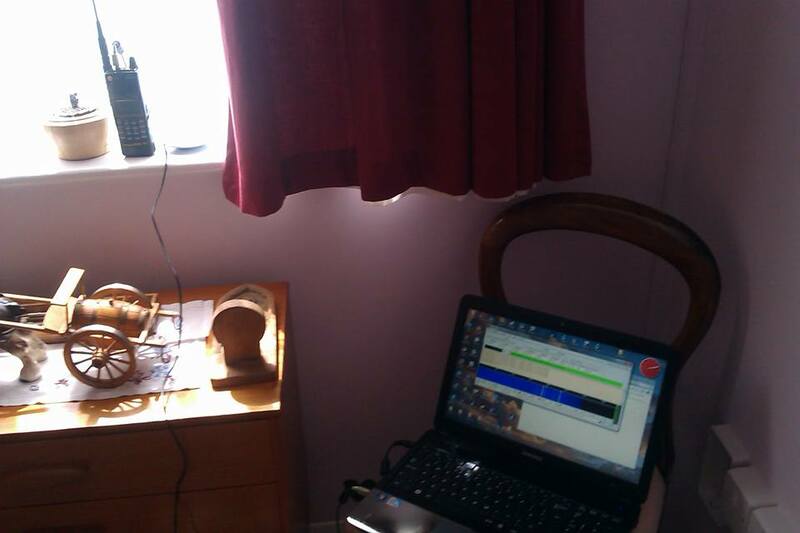 I took the Yaesu FT857-D with a small SLA battery for portable work and a small power supply when in the cottages. Unfortunately things didn’t get off to a good start when I dropped the battery when unpacking. I had used a small screw-terminal chock block to connect to the power loom and the weight of the battery simply ripped both wires out of the terminal block and they touched with an almighty spark and welded themselves together. I acted quickly to remove them from the battery but it has almost certainly affected the battery. Despite this set back the battery performance proved more than sufficient for my needs. 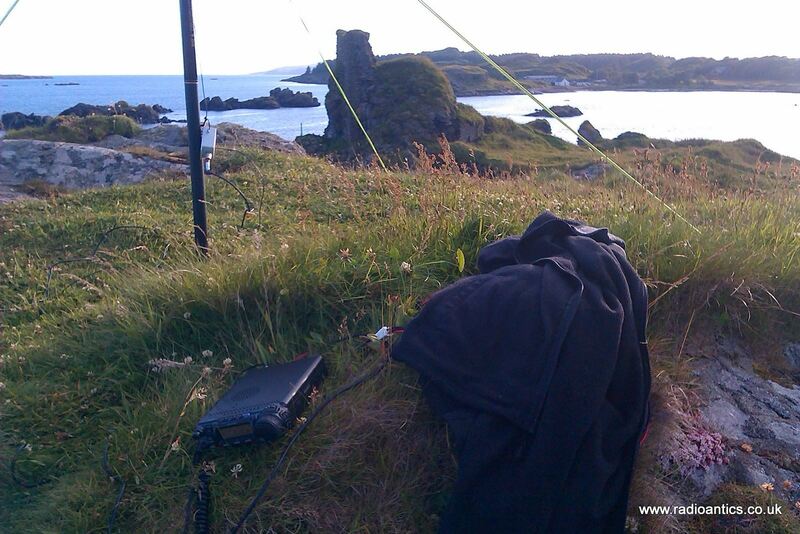 During the first week on Skye, the South Kesteven ARS, which I am the chairman, had their monthly meeting and we planned to try and make a scheduled contact (sked) I did have a run through one evening to test the set up and antenna, drinking a beer and making contacts while sitting on a bench at the cottage watching the sunset going down over Loch Bay with the Outer Hebrides in the distance – sheer bliss! On the night of the sked the famous Scottish midges were out in abundance and I opted to work from inside the cottage. A successful contact and conversation was made even if there were a few issues at the club that night. 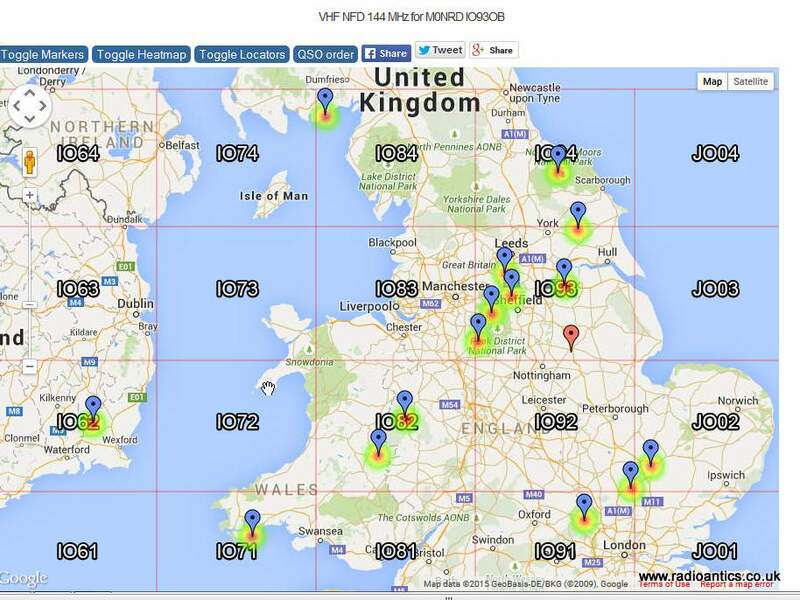 They were unable to get the planned antenna up due to activities in the nearby scout hut but like all good hams they improvised using an Ampro-40 magmounted vertical on top of a large saucepan until they were able to get a dipole up but by then band conditions had started deteriorating, but a contact is a contact. 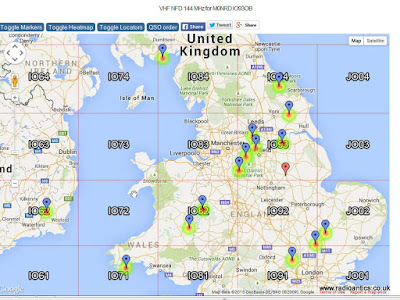 Going portable I had planned to do some Worked All Britain Award activations, the W.A.B scheme uses the Ordnance Survey (OS) mapping agencies National Grid Reference (NGR) system to divide the country into 10km x 10km grid squares. The aim is for activators to operate from the squares and for other operators to “work” those squares. 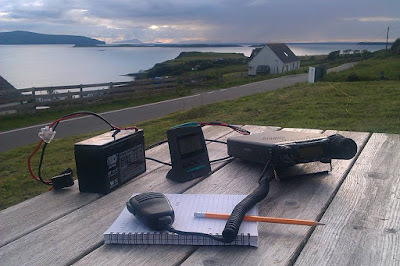 I planned to try to activate some squares and trig points as the more remote locations such as the Scottish Islands are highly sort after as they don’t get activated as often. Firstly before I describe my adventures let me be brutally honest! I am fat, in fact very fat and unfit! I haven’t always in such poor shape, in fact I used to be a keen walker regularly going out at weekends walking miles and even completed several long distance footpaths, including The Coast to Coast Walk back in 1991. I then spent many years competing in dog agility most weekends which kept me reasonably fit but the last few years circumstances have changed and I now have a sedentary lifestyle and desk bound job. This coupled with stress, apathy and being a more than willing victim of comfort eating mean I have piled on the pounds. Why make this confession? Simply because most trig points are on prominent hill tops and high ground throughout the country and therefore will require some physical climbing to get to them. I was under no illusion there were many on Skye and Islay that I stood no chance of reaching without some form of coronary episode! But I had identified a number of more attainable ones requiring on paper just a modest exertion. Instead I opted to go to the coast, specifically Talisker Bay which is glorious and simply activate a WAB square NG33 while the wife and dogs occupied themselves on the beach. So off we went, drove across Skye and walked the mile or so from the parking area carrying the rucksack with radio and pole. 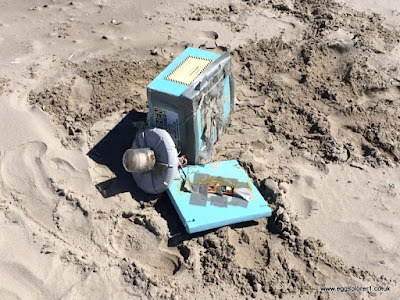 I went of to a nice spot just up of the beach to set up to then discover I had forgotten to pack the coax… never mind had a good few hours on the beach and stopped off at the Talisker distillery on the way back. I hadn’t given up on a Skye trig-point and I had spotted Culnaknock (TP0664) on the North East coast of Skye, which was tantalisingly described as “one your granny could do” and had the advantage of also having a Geocache for the wife to get. So we set off in the car with the dogs for a grand tour round the island and ended up there late one afternoon. 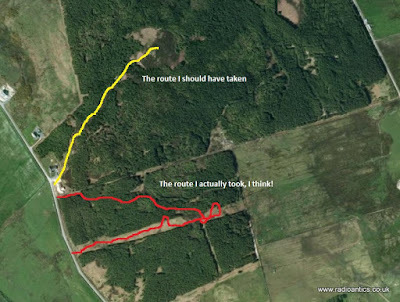 There were a number of suggested approaches, on the first we were met with fences, livestock and a sign saying private and seeing no obvious path up we investigated another through a gate on the main road. This was more straightforward however the nearest parking area was a little way down from the gate. The road was extremely busy and we weren’t comfortable trying to walk up the road with the dogs due to the traffic. I was feeling at little peeved at this point and opted to stay with the car while the wife retrieved the cache and took a photo so I know what I missed. In the end I made no trig point activations on the Isle of Skye, but should we go back at least I am more prepared. The second week of our holiday was on Islay. Islay is simply a fantastic place to visit, much quieter than Skye, probably due to the two hour ferry journey involved and I did manage some portable operating between visiting the eight whisky distilleries and a trip to a ninth on nearby Jura. The cottage we were staying in overlooked Lagavulin Bay with the Lagavulin Distillery and the remains of Dunyvaig Castle, it was a two minute walk to a high point near the ruins where I set up one evening and had an hour operating in the setting sun, again band conditions were poor but I didn’t care, NR44 was activated. There were two trig-points quite near to the cottage. Ardmore Point (TP0875), from the map this looked simple enough, however the road to Ardmore was a private road so couldn’t take the car and while walking there from the nearest parking space was simple enough time didn’t allow it. Cnoc Rhaonastil (TP2293) was another potential trig point, locally called the Fairy Hill it promised spectacular views for short but steep walk, however again parking and access proved problematic and so was never attempted. The Mull of Oa (TP4976) trig-point I actually walked to being next to the American Monument which commemorates the loss of two troop ships in 1918, the Tuscania and the Otranto and the spectacular location overlooks the very spot where the Tuscania sunk. The monument built to thank the inhabitants of Islay for their help is built in the shape of a lighthouse and is visible from many areas on Islay. Despite the very wet ground conditions the walk was straightforward however the weather put paid to any attempt at activating. The wind was very very strong, as this short video demonstrates. The attempt on An Curran (TP0839) really was a comedy of errors, being a fairly modest 49m high and close to where we were staying it should have been straightforward. To get to the summit you have to navigate a dense conifer forest and I had read the description on the trigpointing.uk website of how to ascend via a gate and distinct path. It looked short and simple so didn’t take a map or the GPS with me. I found a gate and what seemed like a path along a wall and set off and quickly the path became indistinct and the trees were indeed very dense, so dense I was struggling to get through them. But I carried on going up gaining altitude thinking I must be nearing the top, however it got to the point I just couldn’t get through the trees anymore and there was no sign of them thinning out as they supposedly did at the summit. It started raining and was having to negotiate water filled hollows, heather and bracken hummocks and swarms of midges – this was not fun! Eventually I did spot a clearing only to find it was where a power line ran up the hillside. I knew I was too far south and since going north through the forest was neigh on impossible I instead descended following the power line through chest high bracken back to the road, all the time worrying about “Serpents” as the locals quaintly called the adders which were prevalent this year. When I did reach the road I had to climb a low dry stone wall and promptly slipped into a deep water filled ditch on the other side, losing a boot in the peaty mud much to the amusement of a passing group of horse riders. I almost decided that this was enough, I was doomed not to activate a trig point however one remained on the hit list and I succeeded in activating it on the final day. I had spotted Cnoc Lolairean (TP2283) when visiting the nearby Bruichladdich Distillery earlier in the week, only 29 meters high it was on a small ridge along the side of Loch Indaal and it involved just a short walk up a farm track and up a narrow track to the top. The wife went of to get a coffee from the nearby mini-market and took the dogs for a walk on the nearby beach while I went to the trig point. What it lacked in height it made up for with the position with fantastic view across to Bowmore and down the Loch. 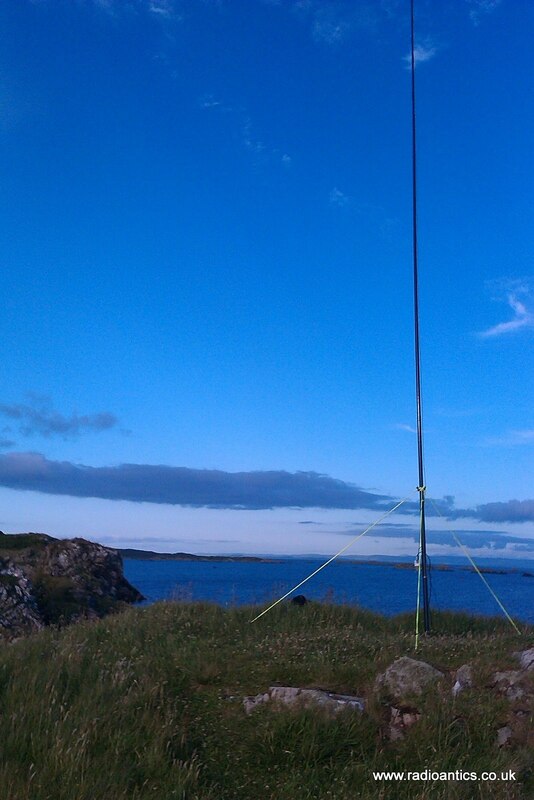 I used bungee cords to hold the pole to the pillar and soon had the inverted-vee up on 40m. 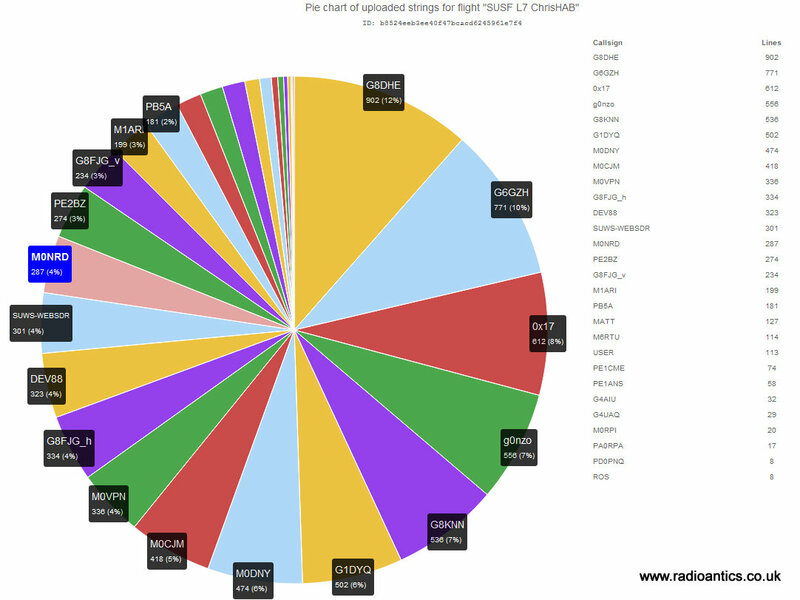 I had around 40 minutes of operating, and band conditions were again poor with lots of noise but I did make a decent number of contacts running approximately 20W before the battery voltage started to drop off. I was especially pleased to work Stewart M0SDM a fellow SKARS member. 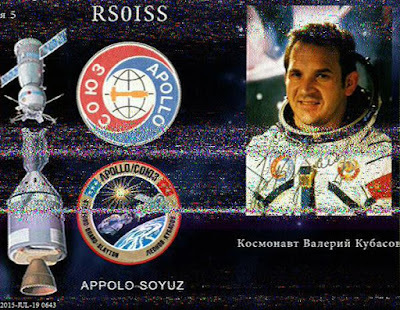 One unexpected radio highlight on Islay was capturing a SSTV image broadcast by the Russians from the International Space Station to celebrate 40 years since the Apollo-Soyuz link up. 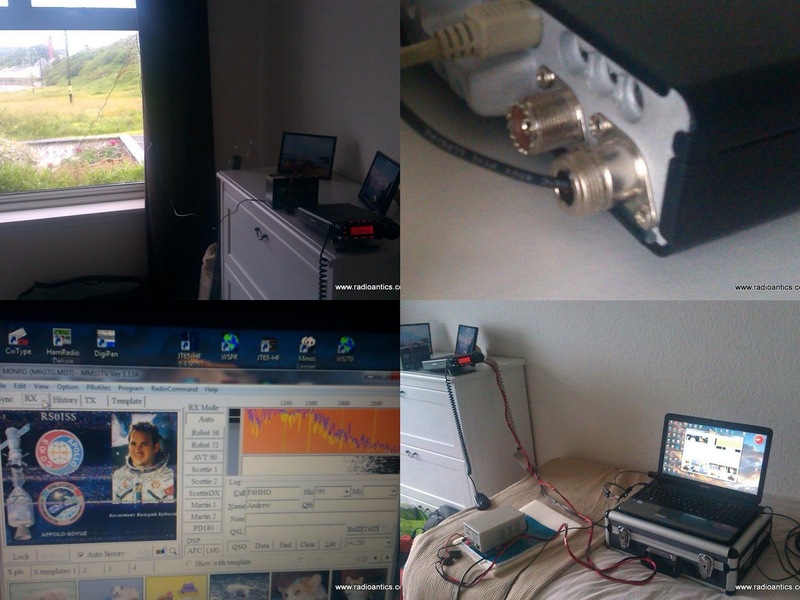 I didn’t know about the SSTV operation before we went on holiday and so hadn’t taken any VHF aerials with me so I just stuck a piece of wire into the back of the FT857-D and dangled it out the window to hopefully catch one of the passes early on the Sunday morning, I hadn’t had time to unpack properly but the captured image was actually quite good considering.